Happening today: Luminato launches its festival, the Script Scrap Project launches new plays, Asiansploitation launches off the deep end, and the Chic-A-Boom Room launches Electronic Cabaret. 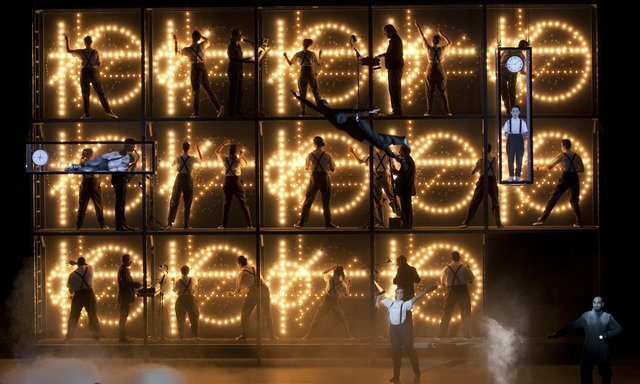 Einstein On The Beach opens tonight as part of the Luminato Festival. Photo by Llesley Leslie-Spinks. The first in the Lunchtime Illumination series will kick off with musician Anna McGarrigle interviewing author Michael Ondaatje. Luminato Hub Lounge, David Pecaut Square (55 John Street), noon—1:30 p.m., FREE. Among the stage offerings, the big ticket is Einstein on the Beach, an opera in four acts from Robert Wilson, Philip Glass, and a LOT of collaborators. There’ll be an introductory pre-show talk before each four-hour-plus performance. Sony Centre for the Performing Arts (1 Front Street East), 5:15 p.m. talk, 6 p.m. show, $25–$175. Fort York will be surrounded this evening by glowing white tents, as The Encampment opens. Every evening from tonight until June 24, the historic site will be opened to visitors to stroll around and take in 200 installations, plus special storytelling and re-enactment performances, commemorating the bicentennial of the War of 1812. Fort York (100 Garrison Road), 7:30 p.m.–11 p.m., FREE. International superstar and hometown hero K’Naan headlines the first night of free Luminato concerts, with opener Kae Sun. David Pecaut Square (55 John Street), 8 p.m., FREE. READING: Bothered by the paucity of local content in Luminato’s stage offerings? There’s still plenty of Toronto-based theatre going on, including The Script Scrap Project, a “four-day festival of New Canadian Theatre.” It opened on Wednesday and runs through Saturday, and features several new plays workshopped or read each night. Among tonight’s offerings is Santa’s Choice, a new play by Erin Fleck, whose Those Who Can’t Do… was nominated for a Dora Mavor Moore Award for Outstanding New Play earlier this week. Free Times Cafe (320 College Street), doors at 6:30 p.m., PWYC. COMEDY: Popular local sketch collective Asiansploitation is running a full-length show, Asiansploitation GOES DEEP, until Saturday. All new sketches include “You Again,” “The Conscience,” and “Dim Sum Carts.” George Ignatieff Theatre (15 Devonshire Place), 8 p.m., $20. CABARET: The ladies of Divagirl and CMC Entertainment’s bi-monthly Chic-a-Boom Room show feature Nuvo-Burlesque, a show from Army of Sass and Bombshell Beauties. In keeping with this edition’s theme of “electronic cabaret,” there’ll also be tunes from guest DJ Lucie Tic. The Mod Club Theatre (722 College Street), doors at 9 p.m., show at 9:30 p.m., $20. CORRECTION: June 8, 5:31PM Previously, this post stated that Einstein on the Beach was appearing at the Four Seasons Centre for the Performing Arts. As noted above, it will be in fact be at the Sony Centre.